Black Elk, a Native American visionary and Lakota Sioux medicine man chronicled by John Neihardt in Black Elk Speaks, believed a coherent vision to be central to a people’s well-being. Black Elk prophetic message was clear—“Without vision, the people perish.” A vision encompasses not only the values and goals a people strive to honor but creates a mythology of who we are, what we stand for and how our vision fits into the cosmic order. Out of this mythology comes its symbolism of meaning that functions in maintaining the moral integrity and stability of the community as a whole, while assisting the individuals as part of the whole through the stages of life, supporting them through crises by grounding them in their vision. Vision permeates what Jung calls the self, “…the organizing principle of the personality”, through the archetypal symbolism we embody tied to the collective unconscious. According to Jung, the self is the archetype of order, organization and most importantly, unification, which harmonizes all other archetypes and their manifestation. The visionary connected self carries us through crises that occur during the course of our individual lives and the history of a people. Joseph Campbell, a professor and lecturer on comparative mythology and author of The Hero with a Thousand Faces, found that danger exists when the social order requirements of social institutions such as religion and political interpretations “…press on people mythological structures that no longer match their human experience”. Furthermore, the symbol or metaphor which expresses the societal mythology must possess a “spiritual aura” signifying a living spiritual core of awakening. If mythological symbols are “…reduced to the concrete goals of a particular political system of socialization”, they lack the “connotative meaning of metaphoric imagery” that leads to a realization of transcendence. This type of concrete symbol merely denotes a localized ethnic meaning caught in a static historical context devoid of universal spiritual significance. Lewis dismissed writing what children might like for entertainment or need to hear on moral grounds. He views these kinds of writers more as anthropologists observing children as a distinct group producing works that they themselves do not like but what children are supposed to like or need educationally or morally. He further cites commercial motives for these types of writers as well. Lewis remarks that he would lay very long odds against the Ministry of Education writing a good story for children. “Good writers neither patronize nor idolize children but treat them with respect”. Lewis advises writers to bring a story into being from the “whole cast of the author’s mind” and write from elements of their own imagination they share with children. He describes his writing process similar to bird watching, initially waiting quietly and watching what pictures arise in the imagination to take form and then joining them up with other similar pictures eventually creating a complete story. Lewis admits that stories rarely come together whole and complete and usually have gaps that need “deliberate inventing” to complete the story. However if the writer is lucky, the whole set of pictures join together “without doing anything yourself” other than taking dictation. The main point of his process is that the story comes up from within the writer’s imagination and is not imposed by outside considerations of marketability or moral necessity. In addition, some of the best stories, Lewis says, are written extemporaneously by authors such as Kenneth Graham, Lewis Carroll and Tolkien for a particular living child. 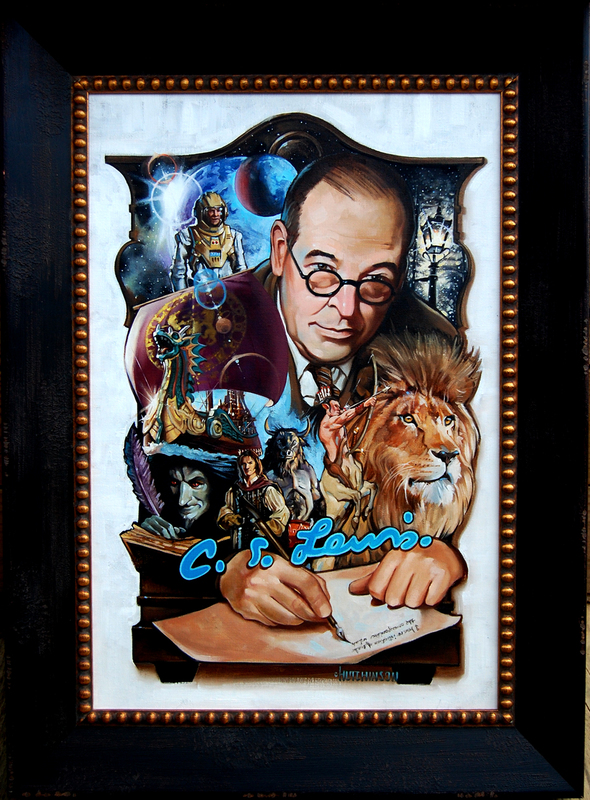 The type of story Lewis recounts as “dearest to my own taste” is the fantasy or fairy tale. He calls these genres a subspecies of children’s stories but we now know them as genres in their own right for both children and adults whether written for children in mind or not. Tolkien claims that the appeal of fairy story lies in the author’s function as a sub-creator, creating a subordinate world of his own rather than commenting on current life situations directly. I view my writing as a co-creation with the Muse and the world created as not subordinate to the “real” world but an integral part of it accessed, as Jung would say, in the archetypes of the collective unconscious. In this way fairy tales, fantasy and visionary fiction can liberate us. I remembered that I was fascinated with magic and what and how I would use magical powers in real life adventures. I devoured Half Magic as a child and found it wonderous to live in that world along with my own day to day world. I also loved A Wrinkle in Time as a twenty-something and of course enjoyed the Harry Potter books as an adult along with my sons. I didn’t just read these books but lived in them. C.S. Lewis’s take on writing for and about children and adults in his various essays have confirmed my own beliefs when I began my magical visionary book series (the Urwelt Chronicles) for children and adults. I am grateful for his generation of fairy tale/fantasy writers that gave us such wonderful classics. For more information on my book series, visit my website: urweltchronicles.com. 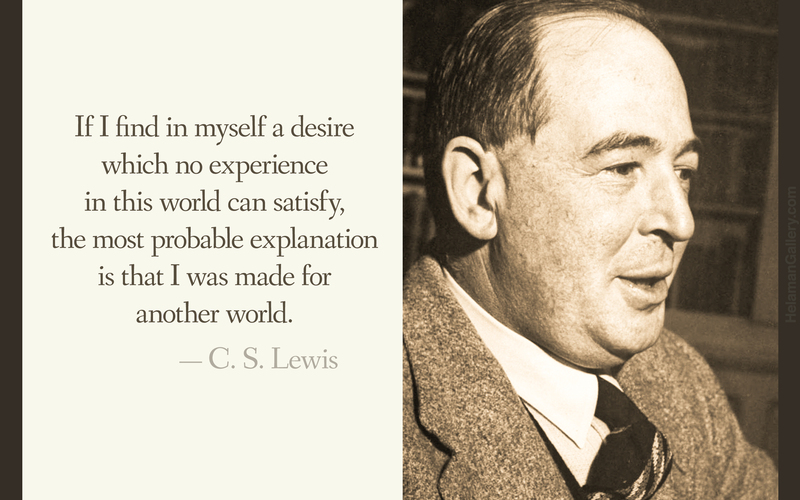 Lewis, C. S. (Ed. Walter Hooper) (1982). C.S. Lewis on Stories and Other Essays on Literature. New York: Harcourt Brace Jovanovich, Publishers. Rice, Constance “In Defense of the Fairy Tale: C.S. 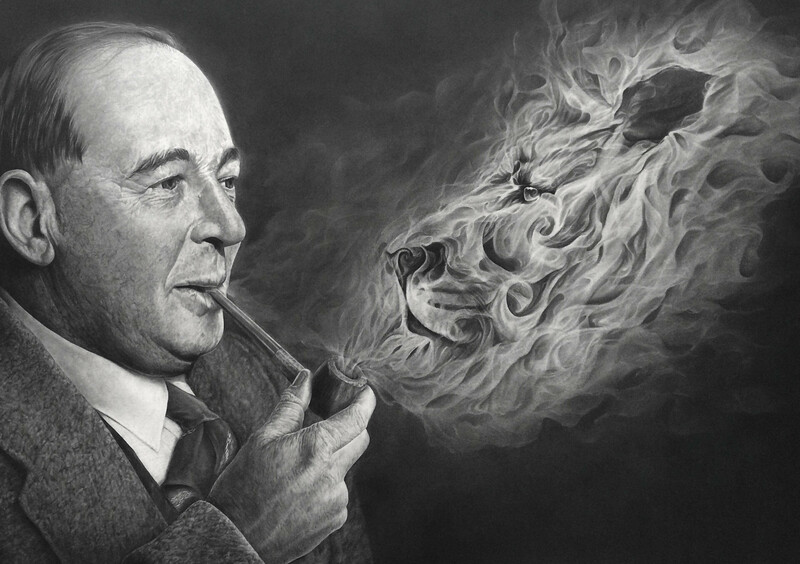 Lewis’s Argument for the Value and Importance of the Fairy Tale” Inklings Forever. 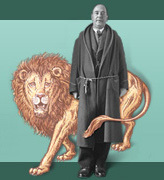 2004. www.taylor.edu/cslewis. I would like to add the Rod (also called a staff or scepter), which symbolizes the knowledge that directs invisible spiritual forces applied to governance, to the Arthurian symbolism of the sword and scabbard (the Cup or Grail Cup). The Rod of Power and its use belongs to the Arthurian Magus, Merlin, who wields it by means of a trained mind in esoteric spiritual knowledge. In short, the Rod of Power represents “…Secret Wisdom employed to guide the affairs of nations” (Fortune, 1993, p. 43). Dion Fortune writes specifically about its use in her letters (seventeen to twenty-two) to other initiates and adepts during World War II contained in The Magical Battle of Britain (edited by Gareth Knight). “…and the Cup and the Sword and Sceptre make a wonderful symbol of balanced and functional force” (Fortune, 1993, p. 36). This triune of symbols, or triple-rayed triangle referred to by Fortune, brings to mind the three-legged stool upon which balance is achieved. Fortune describes the thought form of the triple-rayed triangle as consisting of three definite rays (red for Sword, blue for Scabbard/Cup and purple for Rod/Sceptre) forming the three angles of a triangle through which the white light of Spirit poured. This symbol was built up on the Inner Plane and evoked in 1940 during WWII by the members of the Society of Inner Light trained in occult methods of meditation. The triple-rayed triangle not only represents spiritual forces expressing inner realities but mythical archetypal forces by which national identities are formed, fed and preserved. The third part of this blog explores the warrior king as the Jungian puer archetype with regard to the Qabalistic understanding of the scabbard and sword and its political application. 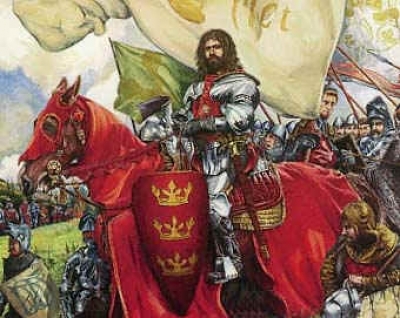 Most of us know King Arthur as the courageous “once and future king” destined to unite Great Britain and establish the peaceful kingdom of Camelot by creating the Knights of the Round Table. However by examining his shallow understanding of the scabbard and sword, it is clear that he personifies the Jungian archetype of the Puer, and that this more than anything else shapes his destiny. The Puer is the quintessential “innocent” eternal male-child who acts in the world without thoughtful consideration often possessed of an early realization of deeper spiritual truths which are treated in a casual manner without mature judgment and value. Since Arthur chooses the importance of the sword over the scabbard, he acts like the quintessential Puer, unable to relate to the world with mature self-regulation. The Puer has an overly-developed fantasy life; layers of illusion cover the reality of his situation which is perhaps why he is unable to at first realize Morgan’s trickery in switching Excalibur and its scabbard for those of unequal value. According to Kime, the sword serves the psychological function as the “…main means of communication with the material world”. The end result is the misappropriation of the use of the sword. 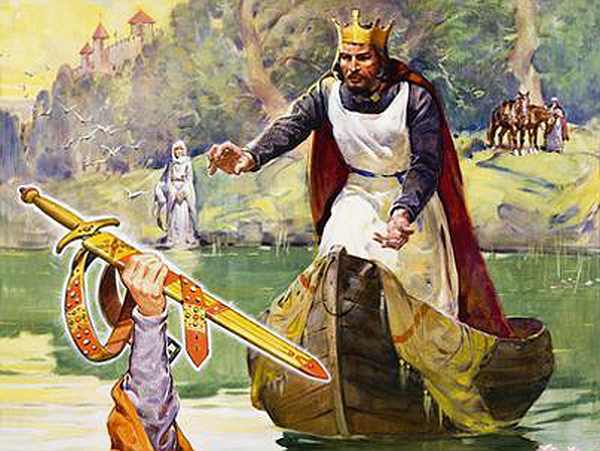 Apologies for the delay in continuing this series of blogs on Arthurian legend. Moving and an operation from which I am fully recovered has sidelined me for the last six months. So onward! The second part of this blog series further discusses Arthur, the sacred warrior king, as the archetypal hero of British legend and his relationship to the divine feminine and further explores the Celtic narrative in which he is situated. Very little of this world has the staying power of mythology. Mythological narratives make use of spiritual and psychological archetypes, as well as, material symbolism to work on the subconscious in an attempt to bring realization of spiritual truths to the level of consciousness. Its archetypal nature is found, as Jung points out, in the collective unconscious of humanity, and is therefore salient to all cultures. Archetypes are primal, such as the great mother/father, warrior, hero, fool, and puer (the eternal male child). Primal archetypes are reinvented and cast in different cultural stories throughout the ages. In western mythology, none is arguably more powerful and pervasive than the mythology surrounding King Arthur and the Knights of the Round Table. Perhaps this is due to Arthur’s later twelfth century medieval personification as the resurrected Christ. Similar to the Christ story, the sacred warrior king and his chivalrous Knights of the Round Table will return when the time is right. This sacred warrior king encapsulates the archetypal hero like no other. And I say “encapsulates” because a wealth of imagery and narrative stories have been built up around him, situated firmly in the elemental/magical forces found in Celtic mythology. 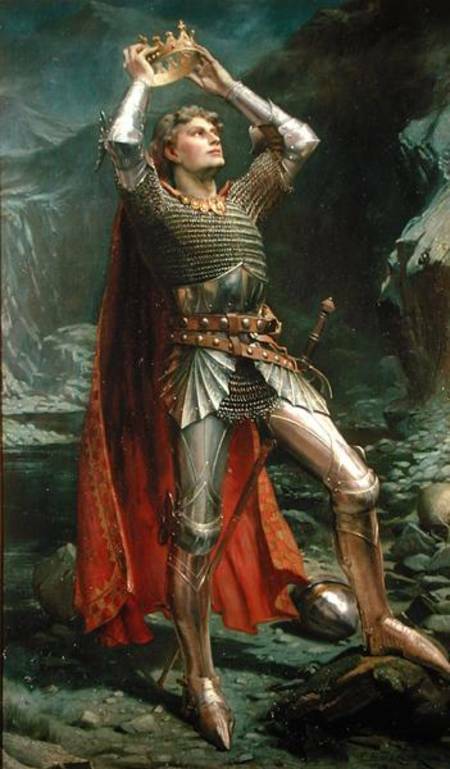 The Arthurian narrative is replete with supernatural beings, magical powers, entrapment, testing of one’s resourcefulness and mettle, and of course, the rapturous love and desire of the troubadour tradition passed on by the oral songs of the bardic poet. The Arthurian narrative is also found in pre-Christian Celtic mythology in stories of young sacrificial gods such as Oengus, Merlin Emrys, and Segda Saerlabraid. The young gods, who serve in a sacrificial role, follow the story cycle of a mysterious conception, fosterage, and pre-destined fate. The sacred king is neither human nor divine but connected and sanctioned by the elements through his relationship with the Goddess of the Land, also known as Sovereignty. Their sacred union is a key feature of Celtic kingship. As such, the sacred king has not only a sacred obligation to the land but to magically empowering objects which he must guard and revere. These objects are called the Hallows of the land, given as gifts by the Goddess of Sovereignty to hold in trust for the entire kingdom. This is the first blog in a series of blogs exploring the symbolic, spiritual and archetypal aspects and meanings of the sacred sword Excalibur and the scabbard in which it rests ready for battle. How the sword is used either for noble purpose or callous disregard will perhaps give us a greater awareness of our own energetic forces where ever they lie—in the personal, political or spiritual arenas. Two primary, and from all appearances, competing stories of how Arthur came to possess Excalibur have been passed down though legend. 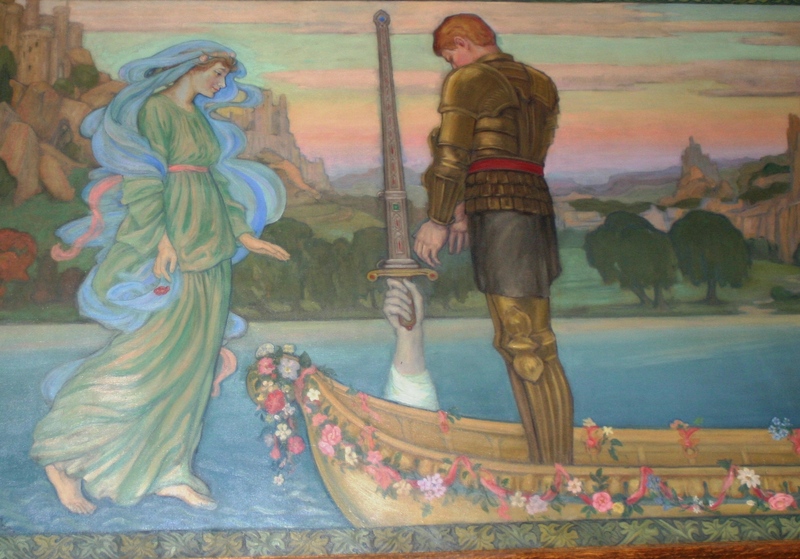 The first of which we are most familiar is the pulling of the sword from the stone or an anvil set on a stone; the second, less fanciful and more in line with Celtic rather than Classical mythology, is the gifting of the sword to Arthur by the Lady of the Lake. 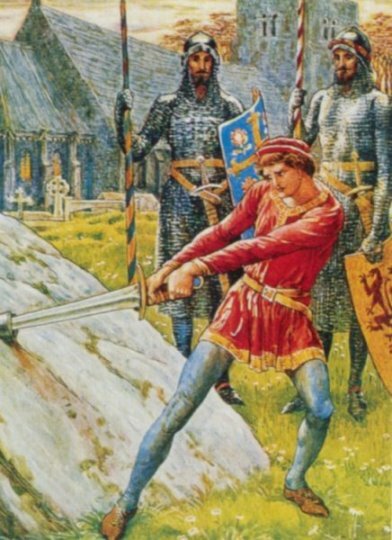 The disneyfied version shows Arthur achieving his kingship and all the authority that goes with it by simply drawing the sword from the stone. However, the story of King Arthur and his predestined rise to kingship of legendary status is steeped in more complex and multifaceted Celtic mythology. Although both stories exemplify Celtic tradition to a greater or lesser degree, they must be seen together as contiguous parts of Arthurian legend to gain a better historical and symbolic understanding of the customs, traditions and spirituality underlying Celtic mythology. Cancer, in a word, cuts to the chase. Procrastination feels obscene, an entitlement no longer allowed. After all, how long will I have the luxury of babbling my inner or outer most thoughts—some inane, others that may on a good day approach profound—into the abyss of the virtual void of the blogosphere? Cancer is something almost no one wants to discuss, not even doctors. They dance around the diagnosis with detailed explanations of medical procedures buffered by words linked in phrases of encouragement, for example, prognosis and cure, stages (of which I am “early”) and positive outcome, etc. 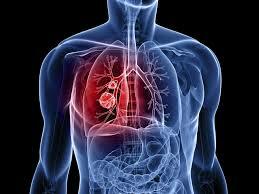 They did not tell me, for example, that the “prognosis” for early stage lung cancer survival rates beyond five years is 49%. 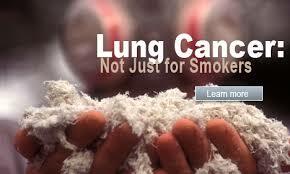 That was left to the blogs and various medical research websites to do. In all fairness, I shouldn’t only paint doctors into this awkward corner. Most people, beyond the “I’m so sorry to hear that” don’t really want to know how I feel or what array of thoughts (sad, purposeful, hopeless, hopeful, anger, disbelief, incredulous, bizarre, stoic and so on) I have, sometimes in the course of one day. I understand this at one level. Humans are hardwired for survival and engaging with the world as part of the living. It is difficult to engage with someone who may be joining the world of the dying. It is a rare gift to be present for those that may not or will not be physically present in the near rather than the far future. This may also be due to the bothersome fact that most of us are hardwired to fix things, even the cycle of life experienced in the birth and death of all living matter. In our bones we have a sense of the sacred, of a relationship to a power greater than ourselves that is archetypal and prehistorical. Jean S. Bolen, M.D. 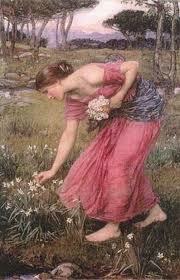 Persephone, the daughter of Zeus and Demeter, went out onto the plain of Enna one sunny morning innocently gathering wildflowers. Hades, the god of the underworld, who coveted Persephone as his bride, chose this moment of unprotected innocence to rise up through a huge gap in the earth. Riding in his chariot he abducted Persephone back into the murky depths of the underworld. Demeter, the goddess of fertility and growth withdrew in mourning for the loss of her daughter causing the earth to turn barren and cold. As famine spread across the land, Zeus sent Hermes, the messenger of the gods, to rescue his daughter. Hades agreed to let her go but for only part of the year during the seasons of growth and harvest. During the winter, Persephone must return to the underworld to live. 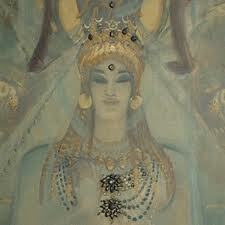 Unlike Persephone, the Sumerian goddess of the outer world, Inanna, chose to enter into the underworld of her own accord to visit her sister Ereshkigal. 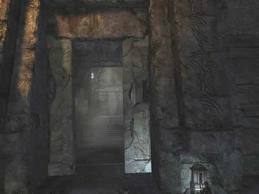 Descending through a series of gateways into the dark unknown, she surrendered pieces of clothing and jewelry at each threshold. Finally, bowed and naked, she entered the final gates of the underworld alone, frightened and without any of the trappings of her outer world existence. The underworld motif found in myth and religion is an apt metaphor for the world the patient enters when undergoing treatment for a life-threatening illness or emergency trauma. Whether snatched like Persephone against her will into the confusing turmoil of the emergency room due to a sudden accidental trauma or, like Inanna, deciding with purpose to descend into the complexities of a treatment program for a serious disease or condition, patients enter the dark underworld often accompanied only by fear and pain. In myth, the underworld was not only considered a place where mortals entered after they died, but also a place for the living as well, whose souls were doomed to wander in the shadows of a surreal existence outside of the norm. Like Persephone and Inanna, bewildered and stripped of their outer world personae and attachments, patients descend through the various gateways of medical tests, operations, and treatments into the underworld of a trauma one hospital. Faced with the dark unknown, patients often experience pain, fear, and anger at the loss of control that comes with the new frightening and unfamiliar surroundings. This is usually the point at which the chaplain enters a patient’s life as a presence of compassion but also as a symbol of the sacred journey towards healing and wholeness. 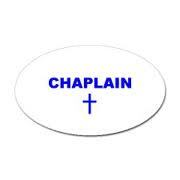 Chaplains are companions of brief duration in this frightening environment offering a willing ear and open heart. Some patients do not return from this journey but those who do are, like Persephone and Inanna, forever changed by the experience. 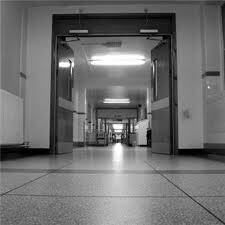 As a trauma one hospital chaplain, I saw the gamut of accidents and diseases that brought patients in for emergency care. During the progression and treatment of a life-threatening illness or sudden life-altering accident, a patient’s psychological defenses start to crumble revealing inner truths which have long been ignored. Sometimes these truths are too painful to fully acknowledge. A mother who has always put the needs of family members first now feels empty when they fail to respond in like manner. A successful businessman fights to maintain the mask of control amid bouts of panic and fear. A cancer patient, experiencing the shock of a terminal diagnosis after recently returning from the cruise vacation of a lifetime where all was right with the world, is numb to any words of consolation. 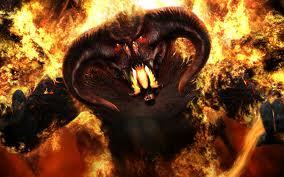 The Destroyer comes unbidden but not without warning to wake us up from our sleepy complacency. The majority of Americans are disconnected, almost anesthetized from our politics preferring to complain rather than actively engage. This leaves a power vacuum into which the Destroyer seeps and grows over time. The Destroyer is the wake-up call for an initiation into a new ethos. The new ethos can be under the Destroyer’s control or we can choose a different path of transformation. The Destroyer also brings us closer in touch with our own mortality, providing us with the opportunity through awareness to recognize the preciousness of life and to act on what we desire for ourselves in the remaining time left and what we aspire to leave behind as our legacy. The Destroyer serves a useful purpose in that it stirs things up creating a temporary chaos, cleansing the old order away so the new can grow in its place. This is the way of life from the beginning of time; the old dies off and makes way for the new. However, to evolve and grow without complete self-destruction, we must be careful not to throw the baby out with the bath water so we have a solid foundation upon which to recreate our lives and our society. Our children build upon the lessons past generations have learned. They also move forward based on past achievements as well. No generation wants to start from scratch. Human growth and development relies on the removal of the dross but also on retaining the gold. Brent Budowsky, a former aide to Senator Lloyd Bensten recently wrote a brief article about Robert Kennedy in The Hill comparing Obama to RFK. In my last post I made reference to the rarity of an iconoclast leader. 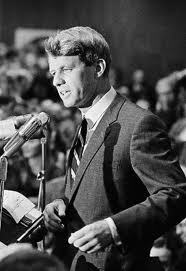 RFK was such a leader in that he was able to transcend the politics of the day and hold fast to his vision which many times lay outside the mainstream consensus. While holding the post of Attorney General from 1960 to 1963, he supported the civil rights movement taking actions which ran counter to the establishment of the day. Originally supporting the Vietnam War, he split with President Johnson and opposed the war’s escalation before most of his colleagues in the Senate and the country at large. The following quote is a portion of RFK’s remarks made during a speech at the University of Kansas on March 18, 1968 after declaring his intention to run for the presidency. “And if we seem powerless to stop this growing division between Americans, who at least confront one another, there are millions more living in the hidden places, whose names and faces are completely unknown – but I have seen these other Americans – I have seen children in Mississippi starving, their bodies so crippled from hunger and their minds have been so destroyed for their whole life that they will have no future. I have seen children in Mississippi – here in the United States – with a gross national product of $800 billion dollars – I have seen children in the Delta area of Mississippi with distended stomachs, whose faces are covered with sores from starvation, and we haven’t developed a policy so we can get enough food so that they can live, so that their children, so that their lives are not destroyed, I don’t think that’s acceptable in the United States of America and I think we need a change. My writing muse seems to come from a higher power. She helps me write with an eloquence and clarity I would not otherwise have. A toast to my muse!